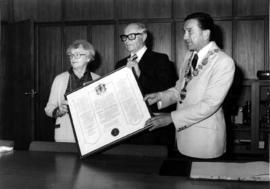 Photograph depicts (l-r) Mrs. Diamond, Jack Diamond, and Mayor Jack Volrich holding a framed certificate.Written on the verso: "P. 1, 2 x 3, 80%, City Honors Jack Diamond, June 28/79." 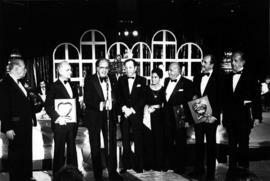 Photograph depicts the Cohen brothers and an unidentified woman receiving an award. Photograph depicts David Nemetz with his award from the Camp Hatikvah Foundation. Photograph depicts David Nemetz at a podium. Photograph depicts David and Elenor Leider and an unidentified man holding a framed certificate. Photograph depicts five unidentified women holding two certificates.